Quinoa is known as a nutritional powerhouse for people with diabetes as it has a low glycemic index. Glycemic index of 55 and below are healthy alternatives for diabetic people. Quinoa is a pseudo-cereal grain which is eaten similarly like a grain. It is also known as the mother of all grains considering its nutrional values. Quinoa products are now found all over the world after acknowledgment of its nutrition. Glycemic index measures how quickly food will raise blood sugar. Thus, low glycemic foods are opted for diabtuc patients as their blood sugar levels spike. Quinoa is a gluten free grain that has gained popularity in the health and fitness world. 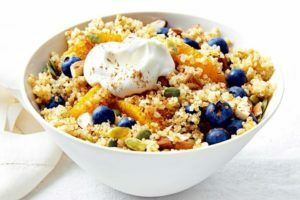 The glycemic index of quinoa is 53. Other low GI grains include oats, barley, amaranth, buckwheat, and other varieties of rice. Quinoa is full of proteins, fiber, amino acids, vitamins, calcium, iron, and other antioxidants. Although the GI index is low, it still has fairly high carbohydrates content which is not a good option for people following a low carb diet. Quinoa has high fiber content almost twice of other grains. Although most of it is insoluble, it still has 2.5 grams of soluble fiber per cup. Soluble fiber is known to reduce blood sugar levels, decrease cholesterol, and aid with weight loss. Quinoa is the best super food for gluten intolreant people. Most people in the United States are now trying to avoid gluten because of several problems arising from its intake. Quinoa is also a good food choice for people who cannot give up staples from their diet like rice, pasta and bread. It is naturally gluten free and can be enjoyed by people without a risk. Amino acids are not produced in the human body but are essential for good health. Quinoa is known as a full protein food as it contains all the nine amino acids. It contains 9 grams of quality protein in a cup and can be an excellent source for vegetarians. Quinoa is rich in minerals like iron, zinc, magnesium, and potassium. It contains all the essential minerals providing 30% of RDI for good health. However, phytic acid contained in quinoa can reduce the absorption of these minerals which can be which can be made ineffective by soaking quinoa before cooking. The nutritonal value of quinoa suggests that it can be good for metabolic health as it will reduce insulin, blood sugar, and triglyceride levels in the body. Quinoa is the healthiest option for people with Metabolic Syndrome as it will work for all factors related to it. However, more research is required to prove its effectiveness on the metabolic rate. Considering the fact that quinoa is good for metabolic health, it can act as a weight loss aid. Quinoa has high protein content which makes it a good option for increasing metabolism whereas fiber will help you remain fuller for longer. Also, its low GI index will account for the low calorie intake. Quinoa is easy to incorporate into your diet by simply rinsing it with water and letting it cook. Quinoa takes only 15 to 20 minutes for preparation and may have a mild and nutty flavor. It is available on most health stores as a healthy food option and will be found easily. Quinoa is a super healthy nutritious food rich in fiber, protein, antioxidants, amino acids, and minerals. It is naturally gluten free and can help to reduce blood sugar levels, cholesterol, and triglycerides.